/ Make money blogging: 5 Things you need to pay attention to! Make money blogging: 5 Things you need to pay attention to! Blogging and making money are so well connected. For one, it is one of the most overrated topics in the blogosphere. If you are into blogging, the next thought that comes to your mind is about making money blogging. The popularity and notoriety of the keyword “make money blogging” proves that. Second, we often see more and more bloggers jump into the blogging world with the mere hope to make money with their blog. There’s nothing wrong with this. But without having the right amount of knowledge about what it takes to make money blogging, how long will it take to make a stable online income and what are the hurdles/difficulties you will face in the process – you can never succeed. 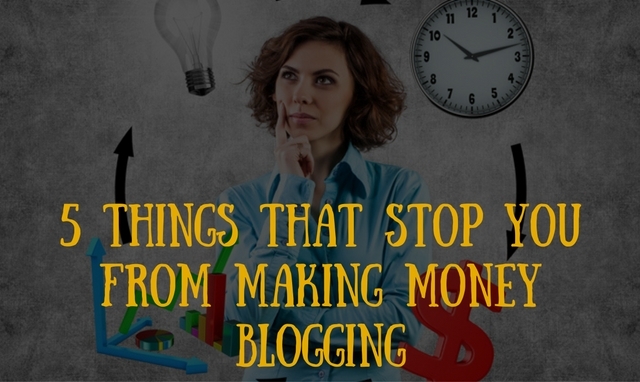 While this is a huge topic, in this blog post I am going to focus on the things that actually stop you from making money blogging! After eliminating all these things will not only help you skyrocket your earnings but will also put you in the right mindset to making money blogging. With blogging, your money (income) doesn’t come from anywhere but from your readers. Your readers are your potential customers. They are the ones who will buy your service or your product. They are the ones that will click on your affiliate links to help you earn commissions. They are the ones you do business with. Without helping them out with your content and as well as with your products/services/recommendations, you cannot expect to make money from your blog. And how can you help them out? You need to first know what they are struggling with. You need to know about their problems and pain points. So you need to first find out who your target audience are and then find out their problems and pain points. And help them out. This could be a counterintuitive advice – but having the “money, money” mindset actually puts you away from making money. I am not saying that you should not think about monetisation methods, or that you should not try and push sales. But trying to look at everything related to blogging as everything about money isn’t going to work. It will drive people away – because nobody likes sales pitches bombarded on their faces all the time. Nobody likes to pay for everything you want to offer. So feel free to share awesome information and send out promotional call-outs sparingly. At the same time, your readers will be willing to pay for well-packaged information that solves their problems. So focus on developing such kind of products or services. No matter how great your content is, if you fail to market your blog, you won’t get the expected results. I see a blog as a marketing tool in itself. Via the content you publish on your blog you are marketing your business! But your blog’s content needs marketing too, or else, all the awesome content you create will never see the light. So yes, spend 20% of the time creating content and 80% of your time and efforts in promoting it! If you fail to do this bit, no matter how hard you try, you can only make pennies out of your efforts! Consistency is a big thing – especially when it comes to blogging! Consistency helps you to scale up your efforts. And I strongly believe that scaling up is highly crucial to make a stable income from your blog. Publishing blog posts whenever you feel like doing so is not going to cut it. Your readers will simply forget about your website because they are loaded with information everyday. Having said that, I am not insisting that you publish everyday – that is not necessary. But whatever frequency you find convenient – stick to that. The same applies for launching products or new services. And promoting affiliate products as well. Be consistent and you can easily scale up your profits. There are so many opportunities in every niche to make money. And the opps keep improving everyday with latest technological advancements. It is really important that you keep yourself updated of the opps in your niche. If you are an affiliate marketer, you need to keep tabs of any launches, sales and stuff like that. You need to be aware of any new affiliate programs that are rolling out. You need to be aware of any new “types” of money making opps in the same promotions you are already running! What’s stopping you from making money blogging? Mostly, its just you and nothing else. So pay attention to these 5 things and improve your chances to make money blogging. In addition, I highly recommend you to pick up my free e-book on making money blogging (Can I really make money blogging?). Just fill out the form below to grab the book right now! Thanks for the clear post. I started a blog to highlight new technology and try to make it approachable. I didn’t necessarily start it with the idea of making money off of it. If I do, great. I am not ignoring the money making side. I have been trying really hard to not keep changing things to make the site an ad farm. I want people to come for the content and hopefully find something helpful and useful. It’s very true that each and every one of ourselves are responsible for not making monew via our blogs. These points are valid and you can not skip any of them. Applying them will male a huge difference with your blog. The first point of knowing your audience is vital. If you don’t know who you’re writing for then your results will stay stagnant. It’s good to study your stats through analytic tools like Google Analytics so you know what type of content bring in the best traffic. Great write up I think you were right on point especially when it comes to consistency. I see new bloggers all the while with dollar signs in their eyes but they don’t seem to know its takes allot of work up front just to get things started and even then you cant relax you just have to keep at it. Other limiting factors includes thinking blogging is easy or a walk in the park, not understanding their audience. Solid post Jane. The big problem in my niche, whenever I think of sharing the article on blog and consider it something new but that topic had been already published on the internet. So, its hard for me to find the new topics in single week. Is there any suggestion for me to make something new for newbies in Blogging and money making niche?